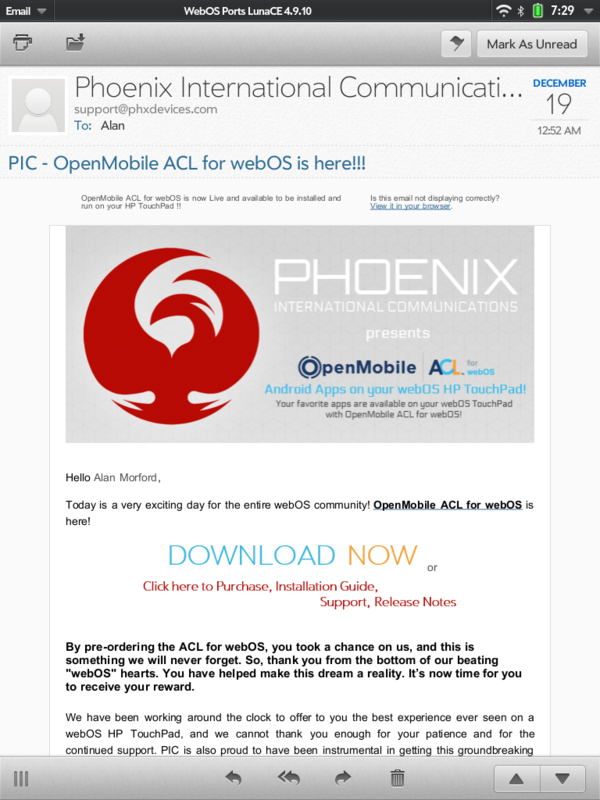 UPDATE: ACL for webOS has been suspended by OpenMobile pending software fixes first reported in the “read this” link below. That’s right, folks. The public release of ACL for webOS version 1.0 is here and available for your purchasing-downloading-license-registering…oh, and using pleasure. The long awaited and highly anticipated ability to run Android apps (provided they are compatible with Android 2.3.x and below) on your HP TouchPad within webOS has arrived. But “not all is well in the state of Denmark”. Before you read the rest and start celebrating, every webOS, Linux, and GPL fan should read this. The normal disclaimers we’ve been hearing for a while which have caused quite the stir are still in effect. Those would be the lack of official OpenMobile and Phoenix International Communications support for both side-loading apps and the lack of support for the HP TouchPad GO. You might remember that Rod Whitby, founder of webOS Internals, recently pulled his support for the ACL for webOS project citing bad communication and frustration at the lack of support for the GO. It’s still a touchy subject. But Brandon (PIC social media relations) and John (OM support) have both chimed in that the functionality will still be there they just won’t help you if it breaks or doesn’t work right. John went on to explain that the GO won’t be supported because they don’t have any way to test it nor will they condone or answer questions about allowing “hacking” of their software. Has he met webOS fans? I digress. Also, this release is being touted as having “outstanding issues”. Funny thing is, the community has been willing to accept this for months. Why release now with “issues” when you could have released 3 months ago with “issues”? To many, it wouldn’t have mattered as long as the release was prefaced with a warning that it wasn’t perfect while also ensuring updates would be frequent. But I digress again. pivotCE will do a review for you folks (unless webOS Nation decides to do one first) in the near future after we’ve had time to play with it. If you already paid for it check your email. Alternately, Rod Whitby has a couple licenses he won’t be using. I know. It’s just rude. They can still make it right. Let’s hope they do.